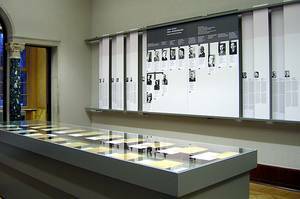 In January 2006, the House of the Wannsee Conference: Memorial and Educational Site opened up a new permanent exhibition. This one has the advantage of acknowledging our recent historical findings which we have accumulated since the opening of the archives in Eastern Europe in the 1990s, and incorporates the experiences of the last thirteen years of educational work at the memorial site. 805,000 visitors from all over the world visited the first permanent exhibition between 1992 and 2005; more than half of those visitors were there to participate in intensive educational programs with the memorial site’s staff. The exhibition is an important part of the diverse set of pedagogical possibilities which are offered here; however it is also accessible to individual visitors who wish to experience the exhibition on their own. Topics and focuses were chosen accordingly, and the presentation was restricted to talking about the basics and to giving examples. The main focus of the site is the Wannsee Conference which took place on January 20, 1942. This conference was where preparations were made for the genocide; the exhibition also focuses on the specific involvement of the conference participants and the authorities they represented in the persecution and murder of Jews. Four rooms are dedicated to these themes (rooms 7 to 10). Following an overview of the historical development of anti-Semitism and racism (room 2), the exhibition shows both the integration of Jews into German society achieved during the Weimar Republic and at the same time, the rise of the threat against them (room 3). It goes on to describe the propagandistic construction of the Volksgemeinschaft (“national community”) after 1933, the exclusion and persecution of the German Jews, but also their own attempts towards self-assertion (room 4). The former guest house of the SS Security Service (SD) is a house of perpetrators. For this reason, several theme-based rooms focus on a number of perpetrator groups, including the Ordnungspolizei (uniformed police) and Wehrmacht members (rooms 5 and 6) as well as the civil administration in the occupied territories (room 12). There is also information about collaboration, a topic which has generated increased research findings since the 1990s (rooms 5, 6 and 11). The exhibition also deals with the frequently raised question of how much was known about the genocide within German society (for example, in room 7). The process of deporting Jews to the ghettos and extermination camps, which has been reconstructed through regional history projects and memorial books, is outlined using three different countries as examples. The exhibition shows the establishment of the ghettos and the role they played in concentrating Jews in one place prior to their murder. It illustrates how forced labour was organised in the ghettos, how day-to-day existence was dominated by hunger, sickness and death, the strategies of resistance adopted by those living in the ghetto, and finally the liquidation of the ghettos (room 12). The continued process of persecution in the transit camps, concentration camps and extermination camps is also exemplified. Life in the camps is described using documents produced by the perpetrators and from the perspective of the victims (rooms 11, 13 and 14). The exhibition looks back at the possibilities for action which existed for the bystanders as well as at the victims’ fight for survival. In order to at least give some faces and names to the millions who were tormented and murdered, four family biographies (presented together in room 1) are featured in the various theme-related rooms. “Time windows” dealing with the juristic attempts to hand down penalties for the crimes, the question of reparations, the politics of remembrance and memorialisation culture, and above all the last room in the tour (room 15), all make it clear that 1945 was not the end of the story.